Senator Brown sweeps through Western Mass. 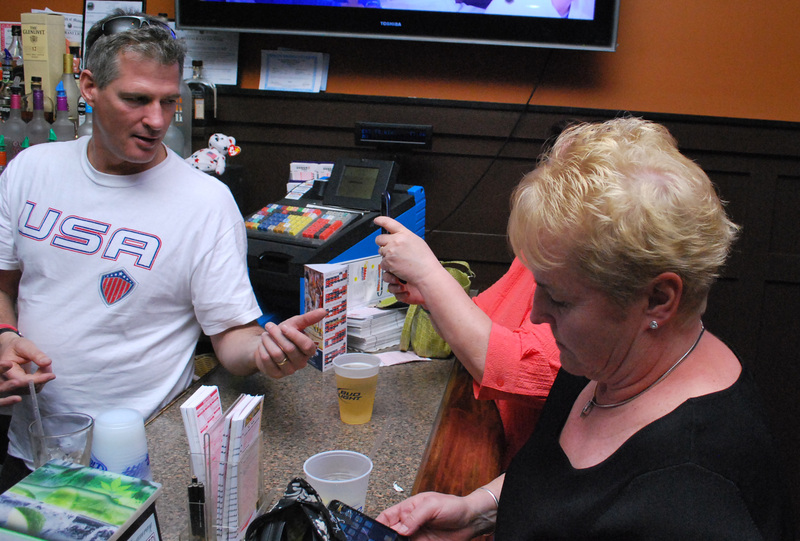 U.S. Sen. Scott Brown (R-MA) takes his turn behind the bar at Pic’s Place in Holyoke on Sunday afternoon. Brown met with constituents and campaigned in Western Mass. over the weekend. HOLYOKE – U. S. Sen. Scott Brown (R-MA) stopped in Holyoke on Sunday afternoon. Brown met with constituents and campaigned throughout the region over the weekend. His campaign rolled into Pic’s Place on Hampden Street. Brown is facing a tough election against former Harvard Law Professor Elizabeth Warren. Warren, who marched in last month’s St. Patrick’s Day Parade, turned in her required signatures last week to be placed on the upcoming ballot. Brown defeated Massachusetts Attorney General Martha Coakley in a special election two years ago, which came about after the death of Sen. Edward M. Kennedy. Brown is completing what would have been Kennedy’s final term. The senator was accompanied by his wife, Gail Huff, a television news reporter in Washington, D.C., as well as several aides. Brown pulled up in his signature pickup truck, which included the couple’s two small dogs. The senator met with patrons and Perry Delude, the bar’s owner. He took a short shift behind the bar and poured a few drafts. Brown also made stops in Agawam, Charleton, Hancock, Pittsfield, North Adams, Webster and Yankee Candle in South Deerfield. Brown focused on jobs and the economy, the themes of his campaign. He said Holyoke presents “opportunities” and “challenges.” The senator spoke at last month’s Holyoke Chamber of Commerce Connections 2012. He said Western Mass. is usually the forgotten region of the state. “I’m here to let people know this is an important part of the state. This is probably my fifth or sixth time in Holyoke alone, and I’m going to continue work hard to try to create that economic certainty, ” he said. Brown said constituents and businesses are unsure about future tax policies or changes instituted by federal regulatory agencies. “The biggest challenge I find is that lack of certainty and stability. I’m going to continue to provide folks with information and continue to be the bipartisan senator, independent senator I said I would be,” he said. Compared to other Senate Republicans, according to Brown, he votes 54 percent of the time with his party. “There’s no secret why I was at the White House last week. I had two bills that were done in a bipartisan manner, the insider trading bill and crowd funding for business,” Brown said. The insider trading bill targets congressional members who use information culled from hearings, research and other sources to either buy or sell stocks or commodities based on that information. Congressional members, particularly those who served on key communities, enriched themselves on whether certain bills were likely or not likely to pass, such as energy or healthcare legislation. The crowd funding legislation, recently signed by the president, opens up financial avenues once barred by the Securities and Exchange Commission [SEC] for small businesses and start-ups. Based on a person’s income, it allows them to attract investors up to $1 million. It calls for minimal SEC filings. Crowd funding had been banned since 1935. “Those are the things I’m working on. Anything to do with jobs, anything to do with working together to solve our country’s real problems, is what I’m all about. I’m not a rock thrower, I’m a problem solver,” said Brown. The senator has hosted several job fairs across the state, including an event in Chicopee last month, which attracted dozens of small businesses and over a thousand applicants. If re-elected, he said he would continue his bipartisan efforts in the Senate, an effort or philosophy, Brown said, not shared by his Democratic opponent. Recent polls show the race between Brown and Warren getting tighter, with only a few percentages points separating the two. “I don’t owe anybody anything expect the people in Massachusetts. I’m nobody’s senator but theirs and the people who voted for me,” said Brown. City Councilor Kevin Jourdain, who arranged the stop, said a cross-section of Holyoke voters came out on Sunday to meet Brown. He said Brown fared well with the heavily Democratic Holyoke electorate in 2010. “We think there’s no reason he can’t win Holyoke this time around, as close as it was last time,” he said. Jourdain said Brown represents the kind of candidate needed in Washington, D.C., a person open to compromise and willing to work with his colleagues across the aisle.